As promised, another nostalgic look back at the things I lost to auction (see “Counting the cost of being an expatriate” if you did not see that yet). Paintings seem to feature high on the list of what I am missing, but, this time I want to mention three small oil paintings of my own. I used to do quite a lot of pencil sketches and quite often a water colour or two but just occasionally I dabbled in oils. I do not claim any high level skills but I do find the process very relaxing and sometimes the outcomes are, well, OK. Enough to allow me to think “well, that looks a bit like what I was TRYING to paint. These three didn`t deserve framing, but they did hang on nails in the conservatory, just as a reminder of the fun I had painting them. Actually, the one in the middle was one I promised myself to come back to and finish one day. Hmmm, maybe never, now! The one on the left was one gorgeous late spring day in the back garden when I thought I would experiment with the impressionist technique called pointillism, where you apply the paint in lots of dots. Seurat was a master of this technique and his paintings in the Museum of Quai d`Orsay in Paris are wonderful if you ever get chance to visit there. The painting of the swan is the one I am most pleased with. It was taken from a photograph but it was me that took the photograph in the first place somewhere near Newark I seem to recall so it counts as Art, of course! I am not sure it bears close inspection and I know where all the imperfections are, naturally, but, nevertheless it pleased its owner. So, I find myself rather ambivalent about this Lot in the Auction. Part of me would like them back for the memories they contain but part of me is hoping they are not in one of the boxes I have yet to collect. It would be nice to think someone else thought they were OK, too, and decided they were worth spending a few pounds on! Hmmm – strange! Bang! GONE – maybe? Should I hope so? 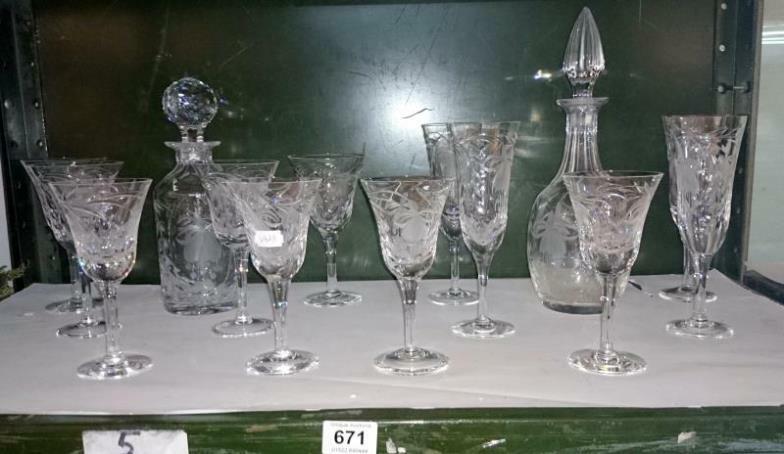 The next item here is a collection of cut glass decanters and glasses. This is partially sentimental in that they were not handed down to me, but Tricia and I decided we actually LIKED the fuschia glasses and decided we would like to own them and use them. Amongst the glasses are four champagne flutes which have seen service for our silver wedding; for a private celebration Tricia and I shared when my Institute was approved to go ahead at the University; for the eightieth birthdays of several elderly relatives, now deceased; and for many other celebratory occasions, too numerous to mention. The reason I am mentioning this here today is that I recall (quite why, I do not know) that each champagne flute was £17 when we bought them and the decanters much more expensive, of course. And yet, they were listed in the sale catalogue with an estimated price under the hammer of between “£10-20” for all of them. So, for about the price of one champagne flute, someone got two sets of glasses and two decanters! Wow, what a bargain. Bang! GONE – for a ridiculously low price. What price a life? Now – back to pictures again. 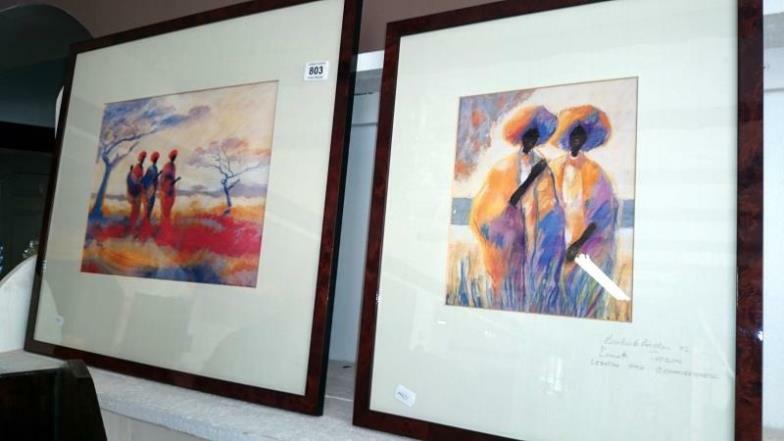 This time a couple of rather nice prints of African scenes – specifically of Lesotho where the artist David Hudson, fell in love with the light and the people and the place, so much so that he kept returning to capture the place and its people in his paintings. So – “why are you worrying about losing a couple of prints?” I hear you asking. And I suppose that is a fair question, since prints, of themselves, are not particularly expensive and can probably be replaced easily enough. WRONG! Let me tell you why. Anyway, we liked his work so much we decided to buy a couple of prints which were available, as you would. And, since we were stopping in Harrogate for a few days of the conference we agreed with the gallery owner that he should have the prints framed for us and we would take them home with us which he duly did. So, what makes them special? The show was opened by David Hudson`s widow and the High Commissioner of Lesotho was present, too, and delightful people they were. And, as had no doubt been agreed with the gallery, they willingly signed our prints. So, they are not “just prints”, they are signed prints, and the bearers of pleasant memories of a special evening out when we went to the show. Bang! GONE, no doubt for £10-20, same as my three amateur paintings above! What a joke! If any of these things seem familiar to you from conversations with friends who have recently bought stuff from Unique Auctions near Lincoln do please get in touch with me via this Blog or directly via email at keith.melton10@gmail.com and I will happily retrieve my artworks and memories from you directly. This entry was posted in Antiques, Auctions, Life..., Paintings, Politics, Whisby and tagged Cut Glass, Decanters, Fuschia. Bookmark the permalink.